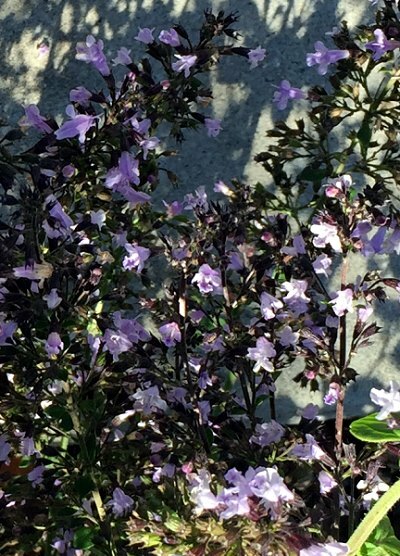 Basil Thyme is an attractive petit aromatic ornamental that makes a good choice for the rock garden or for filling in small spaces in the garden. Since it creeps along the surface of the soil and roots as it goes, it also makes an nice ground cover. It likes full sun but can grow in half day shade with well drained soil. It starts blooming in late spring and is covered with tiny pink sprays of flowers that bees and butterflies love. If you are using it as a low ground cover, these tall flowers can be mowed or cut back to the ground. Late in the season or if plants are in enough shade, the flowers will be darker. Basil Thyme has almost as many botanical names in its history as it has common names in the present. Botanically this one plant had the botanical handles of Clinopdium nepeta, Calamintha nepetoides, Satureja calamintha, Satureja nepeta, Satureja Calamintha officinalis, Calamintha ascendens, Calamintha parviflora, Calamintha nepetoides and Melissa calamintha. 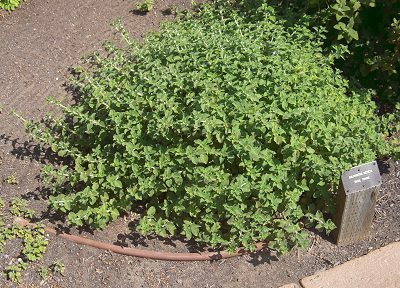 Common names include calamint, lesser calamint, savory and curly mint, nepitella, mountain balm and mountain mint. Native to Europe, Basil Thyme was popular in the Middle Ages as a medicinal herb for the stomach. In The Encyclopedia of Medicinal Plants, it is still recommended for this as well as respiratory infections. It is not for use by those who are pregnant. Basil Thyme's use as a medicinal herb has been pretty much replaced by peppermint. Always check with a qualified practitioner before using any herb medicinally. This plant is sometimes available in plug trays. These trays hold 128 of all the same plant. They are a great low cost way to fill a lot of space. Each cell is 3/4 of inch by an inch. Check here to see if Basil Thyme Plug Trays are available.